Our food pantry serves 75 - 90 area households in need each month. Non-perishable food items and monetary donations come from our parishioners and the Park Ridge community. The Mother Teresa Guild maintains and staffs the pantry and provides ground beef each month. Parishioners from St. Andrew’s Lutheran Church frequently volunteer and make donations. Non-perishable food donations can be dropped off in church, at the rectory, or through the drop box outside the pantry. Monetary donations are also welcome so volunteers can purchase additional items that are needed. The St. Paul of the Cross food pantry is open from 8 - 10 a.m. on the last Saturday of each month, except in November and December when it is open on the third Saturday to accommodate our holiday outreach. 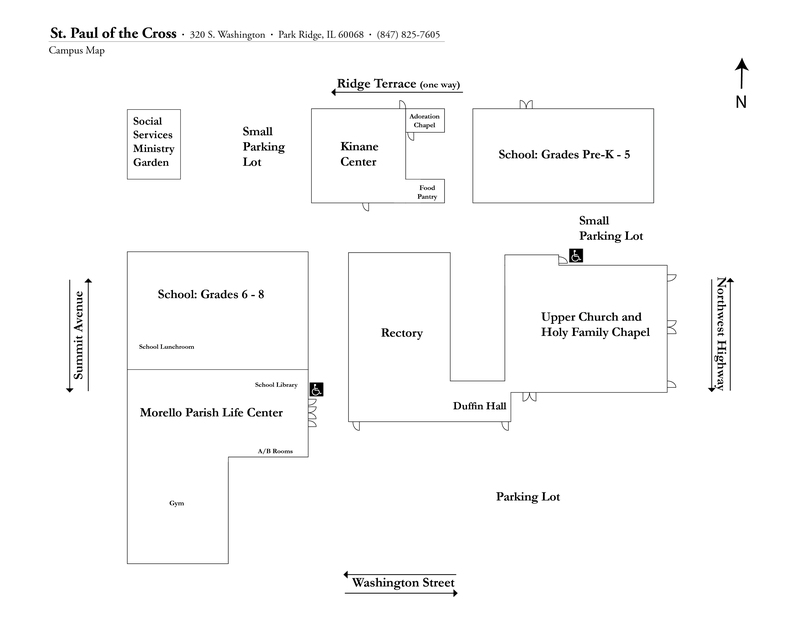 The food pantry is located on campus in the southeast corner of the Kinane Center with its own outside entry. Each year, special Thanksgiving food boxes and turkeys are distributed to our food pantry patrons. The Queen of Peace Guild has generously purchased the turkeys and packed the boxes for over twenty years. This distribution is possible through our annual parish wide Thanksgiving food drive during the second weekend of November. A few volunteers are needed to collect and sort the donations. We also distribute special Christmas food boxes with hams each year on the Saturday before Christmas, with help from the St. Therese the Little Flower Guild. And along with this special food distributions we organize an adopt-a-family program to provide Christmas gifts to the needy in our area. Monetary and gift card donations are always appreciated during the holidays to cover the cost of these outreach programs. If you are interested in volunteering, or donating to these special distributions, or would like to learn more please contact Adrienne Timm.